Sheep is social animal. It likes to be part of the group and to follow the leader toward the new pastures. Sheep communicate with each other via bleating, grunting and snorting sounds. Sheep usually breed during the autumn and winter (certain breeds mate all year round). Male, known as ram, can mate with 30 to 35 females during the breeding season (during a period of 60 days). Pregnancy in ewes (females) lasts 145 to 155 days and ends with 1 to 3 babies (lambs). Babies can stand on their feet from the moment of birth. Ewes form strong bonds with their offspring and bleat to find them in the herd (when they wander off). Lambs are fully weaned at the age of 2 to 3 months. Sheep were regarded as sacred animals in the ancient Egypt. Mummified sheep can be found in the tombs of some pharaohs. Position of the ears and facial expression show emotional state of the sheep. Sheep knows what to eat when it doesn't feel well. It recognizes and eats plants with known healing potential to cure itself. Sheep has good memory and ability to recognize face of 50 different individuals (both of other sheep and humans). 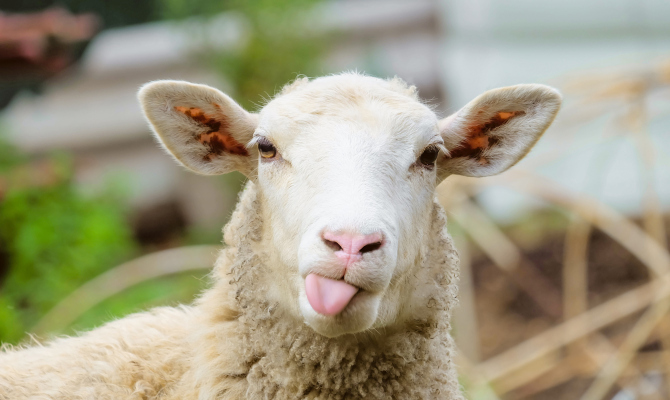 Despite the widespread belief that sheep are stupid, they are actually very intelligent animals (slightly less intelligent than pigs), capable of solving various problems. Sheep is a grazer. Its diet is based on different types of grass. Sheep consumes 2 to 4.5 pounds of food per day. Sheep has field vision of around 300 degrees (it can see behind its head), but it has poor depth perception. Sheep compensates its poor eyesight with excellent sense of hearing. Most species of sheep have spiral horns. Sheep are born with long tail that is often docked at birth to prevent accumulation of dirt. Sheep has an average lifespan 6 to 12 years. Sheep is covered with wool that can be fine (soft), of medium quality or coarse. Wool can be short or long, milky white, brown or black-colored. Sheep can reach 25 to 50 inches in height (at the shoulders) and 99 to 353 pounds of weight.